In 1980, she obtained a copy of an early issue of Just About Horses which showed photos of customized model horses, and she was hooked instantly! Though she rarely has time to do models, she has done a few portrait models, one of which is the beautiful National Champion Paso Fino Stallion, Monterey En Lagrimas. Owned and trained by Cindy Dilks, a long time collector, he has been dubbed as the Black Horse Studio mascot. A nearly lifesize head of Monterey adorns their hotel room doorway at Breyerfest each year, as if he is peeking out to see which collector will next walk through the door. Jane works from good, clear photos, and all effort is put forth so that the portrait will be a treasured piece, even after the beloved horse, dog, cat or other pet is no longer with the owner. Her specialty is pastel, though she also enjoys working in pen & ink, and watercolor. As an avid model horse collector, Jane has decided to make her artwork available in exchange for horse figurines. She especially likes older Breyers, porcelains, resins, original sculptures and the Metlox-Poppytrail pieces. She is currently looking for Pour Horse pieces, as well. If you are interested in trading artwork for models, please feel free to write and let her know what you would be interested in having done, and which horse figurines you would have available to trade. Please be sure to see the other pages of the website. Black Horse Studio, began her professional art career in 1974, the year she married her husband, Ernest. She spent many years doing art shows and horse shows, where she would do on-the-spot portrait sketches and take orders for custom work, and finally settled down to doing primarily commissioned art. 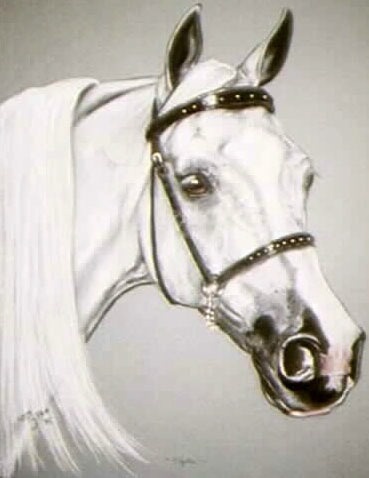 She has even done portraits of foundation horses for the Kellogg Arabian Ranch under her maiden name of Jane E. Johnson in trade for Hagen Renakers!